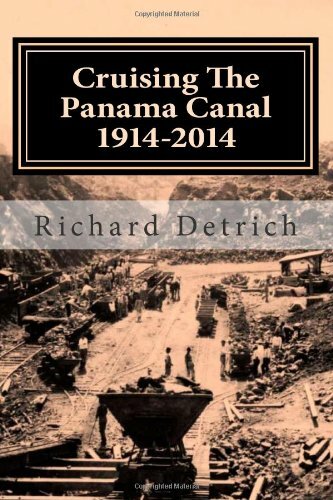 The remarkable Panama Canal will be celebrating its 100th birthday in 2014. This near centenarian holds many surprises for first time visitors like me. The sheer size of the entire operation is difficult to fathom without standing in the Crow’s Nest of a multi-story cruise ship. In addition to the size of the canal, it’s equally impressive that concrete and engineering dating back to the early 1900s have survived so well. Our Holland America ship arrives at Gatun Locks at a much too early 6:30 AM. The cheery cruise staff distributes coffee and helpful printed information including maps for our bleary morning eyes to review. Although I read about the Canal before the cruise, I discover there is much yet to learn. Moving from one end of the canal to the other through this “short cut” is an all day affair. But considering we’re sailing from the Caribbean Sea to the Pacific Ocean, it seems reasonable. Without the Canal, ships would have to navigate an additional 8,000 miles to reach the same destination. Our ship enters the Lock in the right lane and waits for a container ship ahead, heaped with cargo, to move through. The fees for passage are calculated by tonnage. Knowing that our cruise ship paid nearly $135,000 to sail through the canal, I wonder, with the size of that container ship, how steep their tab for passage must be. Images of tractor trailers and sports cars sharing the same lanes on California freeways enters my mind, as another huge container ship prepares to move through the lock in the left lane. In front of it, two small yachts, looking very much like toy boats, are first in line. Our ship waits as the container ship in our lane moves into the front compartment of the lock. When the gates have safely enclosed them, the water in the lock’s middle compartment begins to drain, preparing for our ship. This process takes roughly 20 minutes. Meanwhile, we venture out on deck and pose like celebrities for onlookers taking photos of the ship. Viewing decks on shore are provided for those wanting to experience the locks from the sidelines. Cameras fill hands as the curious spill out onto many balconies. In years past, the accommodations at Gatun were open bleachers, setting viewers out to fry in the heat of the Panama sun. The current building has seating indoors. Lots of waving and cheering goes on between the viewers and the ship’s passengers as we share a mutual excitement to be on the planet together in this particular spot, at this particular moment. Then it’s time for us to continue our journey. Just as airline ground crew guide jetliners into spaces at airports, “mules” guide ships into the lanes of the locks. These chunky, boxy versions of R2D2s skitter along the tracks on both sides of the lane. Cables from the mule reach out and attach to vessels to keep them from drifting too far left or right in the lane. When the water level in the lock ahead matches ours, the massive canal gates open to us. While our ship sails into the Gatun Lock and the gates enclose us, we watch the container ship sail out into Gatun Lake, the 164 square mile body of water ahead. Our water level rises and like a buoy we float on the surface, being elevated to the next plane. As we are stair-stepped to the water level ahead, we see the stillness of Gatun Lake and the many ships lingering there. It appears we’re coming into the home stretch, yet the experience isn’t over. Like the Green Room of show business, Gatun Lake is the place to hover while you wait for your turn to pass through Miraflores, the second set of locks. Panama Canal shore-side officials are responsible for scheduling passage for ships and for trying to avoid congestion from one lock to another. On this day, we see many vessels in the lake and are told there may be a substantial wait. We take advantage of our inactivity by squeezing in a short nap to make up for our early morning call. Currently at Panama, two sets of locks are available for passage with a third under construction, which will accommodate larger ships and consist of two new complexes. It will differ from Gatun in size and design and include rolling gates. The black-soil work area is set back from the banks of the lake. Current engineering promises more cost and water saving plans for the new locks. When completed, they will be 427 meters long and 55 meters wide, the size of four football fields. Sailing away from the locks toward the open Picific Ocean, we’re at once awed by the spectacle of the towering white buildings of Panama City off in the distance. Unfortunately this is one port we won’t be visiting. I envision the miles of water we passed this day, how the colors and the surfaces changed. At the Gatun Locks the water had a yellow tinge to it. But here at the Pacific it’s so blue and inviting I want to jump in. There are many people who have in the past 100 years. The first swim from the Atlantic to the Pacific through the Canal, was performed by two Canal employees. Since they had done the work, they requested that they be the first to swim it. Having lost many of their friends to tropical disease during the construction, their plea was considered even more valid. Their request was granted and on August 18, 1914, three days after the Canal’s opening, they took to the water. They completed their swim in 26 hours and 34 minutes. More swimmers came later. The most delicate “cargo” to pass through was the 150 pound travel writer, Richard Halliburton in 1928. His cost for the passage was a mere 34 cents. I don’t know how that would translate to today’s money but I resisted the impulse to plunge into the ocean. Instead I headed to happy hour to ponder the next tropical port, Costa Rica’s rain forest. Experience the Canal yourself in the pages of this book. I love your pictures and the description of going through the Panama Canal. I had no idea that there were observations porches where people could watch the boats from the shore. How interesting. Your photos were perfect and gave me a good understanding of the experience. One of these days .... Well worth a Pin and a Tweet! Thanks Deb. My husband had worked at the Canal years ago and he told me about the "bleachers". The current set up is far more comfortable for viewers. An excellent description of the experience. 40 years ago I sat in what was then bleachers and watched the ships step down through the locks. It was also hotter than hades. Thanks for you support and comments Ray! Thanks--truly enjoyed your article and I found it extremely inspirational. I've never seen the Canal except in pictures and probably will never see it ay other way so--thanks for the voyage. 2 BIG thumbs from me. Thanks Marlando, I appreciate the read. A magnificent engineering feat. Very informative and well-done article. Thank you for the comment, Sullysee!